Today’s blog post comes from Verónica Estrada Galiñanes, a 2013 Google Summer of Code participant and current student at the University of Neuchâtel in Switzerland. Speaking of GSoC, the accepted students for 2014 have just been announced and the community bonding period is currently under way. Please visit the program website for more information. 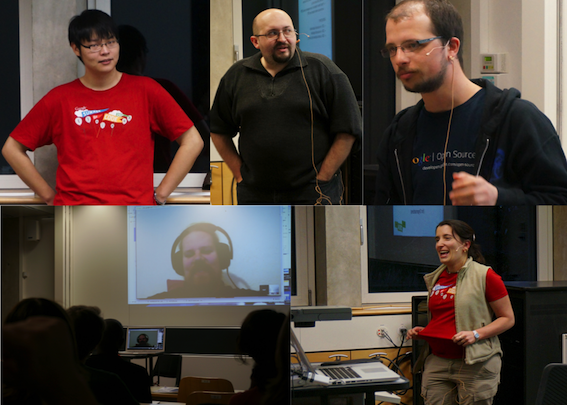 Last December, our Google Group organized a meet-up event in ETH Zurich, Switzerland. Since I am currently completing my PhD at University of Neuchâtel (UniNE), I thought it would be nice to repeat the experience for those living in Western Switzerland. The first step was to propose the idea to UniNE faculty and find potential speakers. Several people offered to help and the idea took off. From Zürich, our previous speakers Seon-Wook Park, Iurii Chernyi and Wolf Bergenheim signed up again as potential speakers. From Geneva, Spyros Gasteratos showed interest to talk about his experiences as a student and a mentor for the OWASP Organization. From UniNE, my colleague Emanuel Onica said he had previous experience and advice to share. The icing on the cake was the generous offer from my supervisor, who offered to buy pizzas for the event! We finalized the date for February 27th. Thanks to another GSoC enthusiast, Etienne Riviere, the event received publicity at six universities including University of Bern, University of Neuchâtel, University of Fribourg, University of Lausanne, University of Geneva and the University of Applied Science Western Switzerland. I also designed the event website, a Facebook public event and a registration form. The event was further promoted in the local newspaper and announced in the official UniNE website and calendars. Events sometimes come with a few surprises and in our case, two confirmed speakers canceled the day of the meet-up. However, we found a solution that allowed the speakers to join via a Google Hangout which turned out to be quite successful. The evening of the event arrived, and we were excited to see we had almost achieved 100% attendance! Our audience was quite diverse, with computer science students from all level of studies participating in the event. 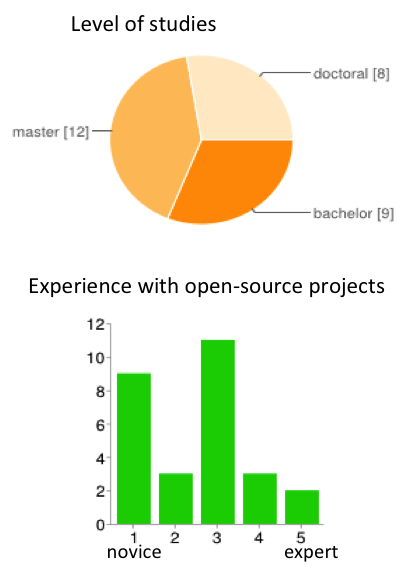 Some had experience with open-source projects but few had previous experience with GSoC. I opened the informative session by giving a general talk to explain the what and why of GSoC. We then moved to the next subject — the experience of the student and mentor in GSoC. I gave a short overview of my student project on file sharing in Freenet Project. The guest speakers, Seon-Wook, Spyros and Emanuel did a great job by sharing inspirational stories and giving valuable advice. The event closed with a question-answer session driven by Wolf through a hangout. Questions like: "What kind of projects are selected by Google?" or "Should I apply to a project in which I am already involved?" were addressed by the speakers. In the end, we all enjoyed pizza and other snacks while chatting about our future plans regarding GSoC. The video of our talks can be found on YouTube (slides only) and the complete version is found here (speakers and slides sync).